Floods are part of the Australian landscape. Here trees mark the seasonal riverbeds in the Queensland outback between Cloncurry and Mount Isa. Gold Coast Regional Botanic Gardens is one of the green areas along the Nerang River that could be used to store and retain flood water. South-East Queensland residents need to prepare for more regular floods, according to new data. New data recording the past 1,500 years of flows in the Brisbane River have revealed that South-East Queensland’s climate – once assumed to be largely stable – is in fact highly variable. Until now, we have only had access to 200 years of weather records in South-East Queensland. But our new research used marine sediment cores (dirt from the bottom of the ocean) to reconstruct stream flows and rainfall over past millennia. This shows that long droughts and regular floods are both prominent features in South-East Queensland’s climate. This is concerning. Decisions about where we build infrastructure and how we use water have been based on the assumption that our climate – especially rainfall – is relatively stable. 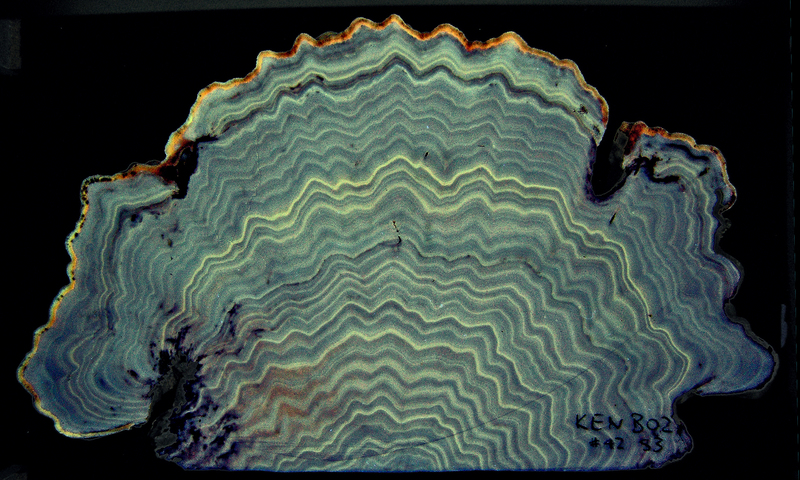 Natural archives of climate are preserved within things such as tree rings, coral skeletons, ice cores, lake or marine sediments. Examining them lets us extend our climate records back beyond documented history. We can then undertake water planning in the context of a longer record of climate, instead of our short-term instrumental records. In this study, we used sediment cores from Moreton Bay (next to the mouth of the Brisbane River) to reconstruct the river’s flow over the past 1,500 years. In these cores we measured various indicators of fresh water to reconstruct a record of streamflow and regional rainfall. At the turn of the last millennium the region was in the middle of a prolonged dry spell that lasted some six centuries, from roughly the year 600 to 1200. After about 1350 the region became gradually wetter, with peaks revealing a series of extreme floods in the late 1600s and early 1700s. Large floods in the 1700s have also been documented in the upper reaches of the catchment, in the Lockyer Valley. These broad shifts in regional rainfall and streamflow are linked to drivers of global climates, including hemispheric cooling and the El Niño-Southern Oscillation. A cool La Niña-dominant climate that persisted from roughly 1350 until 1750 caused increased rainfall and reduced evaporation. In addition, the southward displacement of monsoon troughs at this time may have increased the likelihood of cyclone-related weather systems reaching southern Queensland. This information helps us contextualise the climate of the last 200 years and gives us some insights into how regional rainfall responds to shifts in global climate. Over the past 20 years, South-East Queensland has experienced its fair share of extreme weather events. Severe floods have caused deaths and damaged infrastructure. Flooding cost the Australian economy some A$30 billion in 2011. Regular droughts may mean South-East Queensland needs to rethink water resource strategies. The millennium drought, which in this region was most severe from 2003-08, resulted in widespread water shortages. This prompted major investment in the South-East Queensland Water Grid, a connected network of dams, water treatment plants, reservoirs, pump stations and pipelines. So far Queensland has coped with everything Mother Nature has thrown at it. But what if extreme floods and droughts became the norm rather than the exception? The 2011 and 2013 floods highlighted the vulnerability to these extreme events of Brisbane’s major water treatment facility at Mt Crosby. The drinking water supply to the city in 2013 became too muddy for purification. The 2011 flood was also alarmingly muddy. Our reconstruction found that big floods over the past 1,500 years rivalled the size of floods in recorded history (1893, 1974 and 2011), but the level of sediment in the water of more recent floods seems to be unprecedented. This indicates that historical and ongoing land-use changes in the Brisbane River catchment are contributing to more abrupt and erosive floods. This will continue unless better land management techniques are adopted to improve the resilience of catchments to extreme weather events. We are learning that over the last millennium natural climate and rainfall have been more variable than previously thought. This means that modern anthropogenic climate change may be exacerbated by a background of already high natural climate variability. In addition, our water infrastructure has been built based on a narrow understanding of natural climate variability, limited to the last 200 years. This may mean the quantity of reliable long-term freshwater resources in eastern Australia has been overestimated. Droughts & flooding rains: what is due to climate change? Most major floods in South East Queensland arrive in five-year bursts, once every 40 years or so, according to our new research. Yet flood estimation, protection and management approaches are still designed on the basis that flood risk stays the same all the time – despite clear evidence that it doesn’t. We analysed historical flooding data from ten major catchments in South East Queensland. As we report in the Australasian Journal of Water Resources, 80% of significant floods arrived during five-year windows, with 35-year gaps of relative dryness between. The early 1970s brought a succession of severe floods to South East Queensland. This was followed in the 1980s by a raft of floodplain development projects, together with extensive research on floodplains and flooding risk, carried out by a group of researchers who described themselves as the “Roadshow” because of their frequent visits to flood-prone regions. Throughout the 1980s, some Roadshow members noticed that large floods in South East Queensland seemed to follow a 40-year cycle, with five-year periods of high flood risk separated by 35 years of lower flood risk. They speculated that the next “1974 flood” (a reference to a devastating flood that hit Brisbane and South East Queensland that year) would arrive some time around 2013 . Sure enough, South East Queensland was once again hit by large floods in January 2011 and January 2013. Evidently, large floods in South East Queensland are not random. This is a problem, given that development policies and engineering practice, by and large, still assume that they are. In 1931, the Queensland meteorologist and farmer Inigo Jones linked the Brisbane River’s floods to the Bruckner Cycle of solar activity, which he determined to be 35 years long, but which has since been found to vary from 35 to 45 years. In 1972, flood engineer John Ward argued that flood frequency distributions differ in space and time because higher flows originate from a variety of different rainfall mechanisms. At the time, minimal insight was available into what those different rainfall mechanisms were. In the 1990s, drought research in Queensland by, among others, researchers Roger Stone and Ken Brook and John Carter identified cyclical variations in Queensland rainfall associated with the Southern Oscillation Index (SOI), supporting the idea of non-random occurrence of floods. In 1999, Australian hydrologist Robert French also noticed that irregular clustering of flood events was associated with the SOI, and pointed out that flood planning needed to take into account more than just seasonal or year to year variability. More recently, flood incidence has been strongly linked to large-scale ocean processes such as the El Niño/Southern Oscillation (ENSO) and the Interdecadal Pacific Oscillation (IPO). These phenomena seem to have a marked effect on eastern Australian rainfall variability, and therefore on the risk of both floods and drought. Is the 40-year cycle real? We compiled records of major floods in South East Queensland between 1890 and 2014. As the table below shows, roughly 80% of large historical floods happened within a series of five-year flood-prone periods, despite these periods together representing only 16% of the study period. The South East Queensland study area (approximately indicated by the orange box) and the 10 catchments analysed in this study. Timing of the largest flood events within the 40-year cycles. Superscripts next to each flood event indicate the ranking of that flood event in that catchment (that is, the largest flood in each catchment is ranked 1). On average, the number of large floods per year was 4.9 times higher within the five-year flood-prone periods. Not only were floods more frequent, they were also more severe, with flood heights 41% higher during the five-year flood-prone periods than at other times. Even though a few large floods occurred outside the five-year flood-prone periods, the 40-year cycle of flooding in South East Queensland appears to be a genuine phenomenon. The most likely physical explanation for cyclic or non-random flooding is the IPO, which is rather like the ENSO cycle except on longer time scales. The IPO influences eastern Australia’s climate indirectly, by affecting both the magnitude and frequency of ENSO impacts. Recent “negative phases” of the IPO – meaning warmer than average Pacific Ocean temperatures north and south of the tropics – happened roughly during 1870–95, 1945-76, and 1999–present. If we compare these with the five-year flood-prone periods in the table above, we can see that with the exception of 1930–34, all five-year flood-prone periods happened during these negative IPO events. Interestingly, the large floods in the 1950s and 1960s happened outside the five-year flood-prone periods identified by the 1980s Roadshow, but do align with IPO negative conditions. In spite of all this evidence, most engineers and flood planners still assume that floods occur randomly and that flood risk is the same all the time. Phrases like “one in 100-year event” or “1% annual exceedance probability” are routinely used to describe floods, despite the fact that for some years and decades the risk is significantly higher. This gives a false sense of security during times when major floods are much more likely. If this approach continues, then every few decades our flood defences will not be as reliable as we thought – a fact to which many Queenslanders can now attest. We need new approaches to deal with the reality that large flood events do not occur randomly. It would arguably be more sensible to separate flood records into two (or more) categories – one for times when flood risk is “normal” and another for periods where the risk is higher – and then reevaluate flood frequency distributions and flood risks for each category. Decision makers then get a more realistic estimate of the true risk of flooding which leads to more informed and more resilient flood planning and defences. This new approach might also help plan for the changes to flood risk expected in the future, whether from climate change, land use change, or whatever else the oceans and skies throw at us. This article was coauthored by Greg McMahon, a Brisbane-based independent consultant on flood risks and Academic Chair at Rhodes Group Australia. Globally, floods seem to be decreasing even as extreme rainfall rises. Why? Over the past decade we have seen a substantial increase in our scientific understanding of how climate change affects extreme rainfall events. Not only do our climate models suggest that heavy rainfall events will intensify as the atmosphere warms, but we have also seen these projections start to become reality, with observed increases in rainfall intensity in two-thirds of the places covered by our global database. Given this, we might expect that the risk of floods should be increasing globally as well. When it comes to global flood damage, the economic losses increased from roughly US$7 billion per year in the 1980s to US$24 billion per year in 2001-11 (adjusted for inflation). It would be natural to conclude that at least some of this should be attributable to climate change. However, we know that our global population is increasing rapidly and that more people now live in flood-prone areas, particularly in developing countries. Our assets are also becoming more valuable – one only needs to look at rising Australian house prices to see that the values of homes at risk of flooding would be much greater now than they used to be in decades past. So how much of this change in flood risk is really attributable to the observed changes in extreme rainfall? This is where the story gets much more complicated, with our new research showing that this question is still a long way from being answered. Are floods on the rise? To understand whether flood risk is changing – even after accounting for changes in population or asset value – we looked at measurements of the highest water flows at a given location for each year of record. This sort of data is easy to collect, and as such we have reasonably reliable records to study. There are more than 9,000 streamflow gauges around the world, some of which have been collecting data for more than a century. We can thus determine when and how often each location has experienced particularly high volumes of water flow (called “large streamflow events”), and work out whether its flood frequency has changed. A streamflow gauging station in Scotland. We found that many more locations have experienced a decrease in large streamflow events than have experienced an increase. These decreases are particularly evident in tropical, arid, and humid snowy climate regions, whereas locations with increasing trends were more prevalent in temperate regions. To understand our findings, we must first look closely at the factors that could alter the frequency and magnitude of these large streamflow events. These factors are many and varied, and not all of them are related directly to climate. For example, land-use changes, regulated water releases (through dam operations), and the construction of channels or flood levées could all influence streamflow measurements. We looked into this further by focusing on water catchments that do not have large upstream dams, and have not experienced large changes in forest cover that would alter water runoff patterns. Interestingly, this barely changed our results – we still found more locations with decreasing trends than increasing trends. 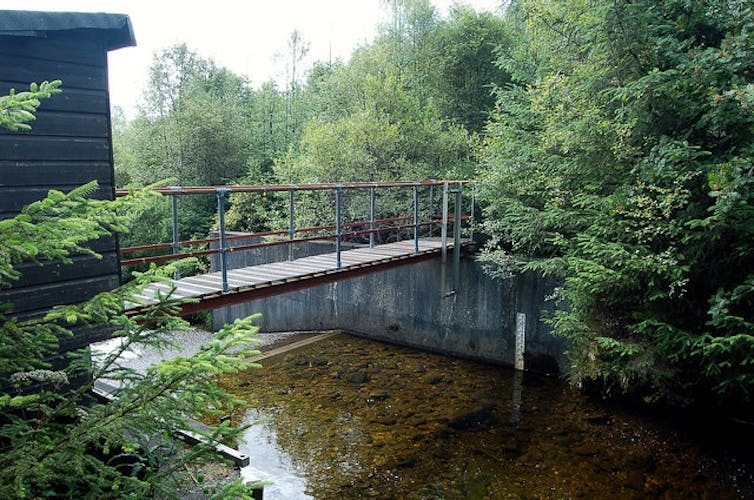 The Australian Bureau of Meteorology and similar agencies worldwide have also gone to great lengths to assemble “reference hydrological stations”, in catchments that have experienced relatively limited human change. Studies that used these sorts of stations in Australia, North America and Europe are all still consistent with our findings – namely that most stations show either limited changes or decreases in large streamflow events, depending on their location. What can we say about future flood risk? So what about the apparent contradiction between the observed increases in extreme rainfall and the observed decreases in large streamflow events? As noted above, our results don’t seem to be heavily influenced by changes in land use, so this is unlikely to be the primary explanation. An alternative explanation is that, perhaps counterintuitively, extreme rainfall is not the only cause of floods. If one considers the 2010-11 floods in Queensland, these happened because of heavy rainfall in December and January, but an important part of the picture is that the catchments were already “primed” for flooding by a very wet spring. Perhaps the way in which catchments are primed for floods is changing. This would make sense, because climate change also can cause higher potential moisture loss from soils and plants, and reductions in average annual rainfall in many parts of the world, such as has been projected for large parts of Australia. This could mean that catchments in many parts of the world are getting drier on average, which might mean that extreme rainfall events, when they do arrive, are less likely to trigger floods. But testing this hypothesis is difficult, so the jury is still out on whether this can explain our findings. Despite these uncertainties, we can be confident that the impacts of climate change on flooding will be much more nuanced than is commonly appreciated, with decreases in some places and increases in others. Your own flood risk will probably be determined by your local geography. If you live in a low-lying catchment close to the ocean (and therefore affected by sea level rise), you’re probably at increased risk. If you’re in a small urban catchment that is sensitive to short sharp storms, there is emerging evidence that you may be at increased risk too. But for larger rural catchments, or places where floods are generally caused by snow melt, the outcome is far harder to predict and certain locations may see a decrease in flooding. All of this means that a one-size-fits-all approach is unlikely to be suitable if we are to allocate our resources wisely in adjusting to future flood risk. We must also think about the effects of climate change in a broader context that includes changes to land-use planning, investment in flood protection infrastructure, flood insurance, early warning systems, and so on. Only by taking a holistic view, informed by the best available science, can we truly minimise risk and maximise our resilience to future floods. Was Tasmania’s summer of fires and floods a glimpse of its climate future? Drought, fires, floods, marine heatwaves – Tasmania has had a tough time this summer. These events damaged its natural environment, including world heritage forests and alpine areas, and affected homes, businesses and energy security. In past decades, climate-related warming of Tasmania’s land and ocean environments has seen dozens of marine species moving south, contributed to dieback in several tree species, and encouraged businesses and people from mainland Australia to relocate. These slow changes don’t generate a lot of attention, but this summer’s events have made people sit up and take notice. If climate change will produce conditions that we have never seen before, did Tasmania just get a glimpse of this future? After the coldest winter in half a century, Tasmania experienced a warm and very dry spring in 2015, including a record dry October. During this time there was a strong El Niño event in the Pacific Ocean and a positive Indian Ocean Dipole event, both of which influence Tasmania’s climate. The dry spring was followed by Tasmania’s warmest summer since records began in 1910, with temperatures 1.78℃ above the long-term average. Many regions, especially the west coast, stayed dry during the summer – a pattern consistent with climate projections. The dry spring and summer led to a reduction in available water, including a reduction of inflows into reservoirs. Left: September-November 2015 rainfall, relative to the long-term average. Right: December 2015-February 2016 temperatures, relative to the long-term average. Tourists and locals alike enjoyed the clear, warm days – but these conditions came at a cost, priming Tasmania for damaging bushfires. Three big lightning storms struck, including one on January 13 that delivered almost 2,000 lightning strikes and sparked many fires, particularly in the state’s northwest. By the end of February, more than 300 fires had burned more than 120,000 hectares, including more than 1% of Tasmania’s World Heritage Area – alpine areas that had not burnt since the end of the last ice age some 8,000 years ago. Their fire-sensitive cushion plants and endemic pine forests are unlikely to recover, due to the loss of peat and soils. Meanwhile, the state’s emergency resources were further stretched by heavy rain at the end of January. This caused flash flooding in several east coast towns, some of which received their highest rainfall ever. Launceston experienced its second-wettest day on record, while Gray recorded 221 mm in one day, and 489 mm over four days. Flooding and road closures isolated parts of the state for several days, and many businesses (particularly tourism) suffered weeks of disruption. The extreme rainfall was caused by an intense low-pressure system – the Climate Futures for Tasmania project has predicted that this kind of event will become more frequent in the state’s northeast under a warming climate. 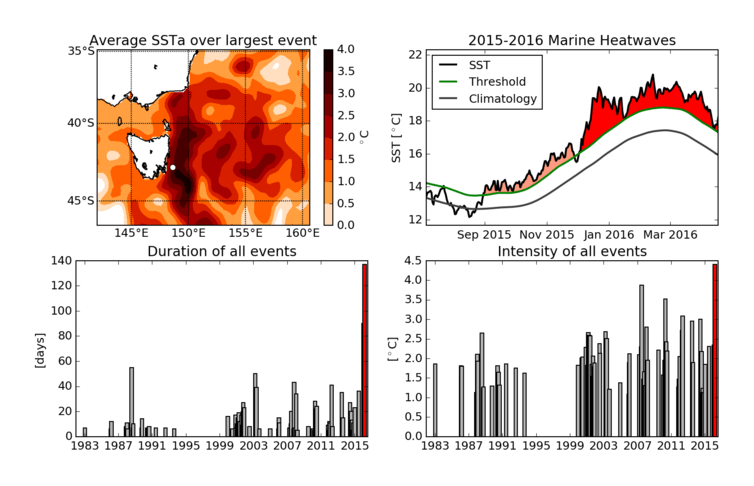 This summer, an extended marine heatwave also developed off eastern Tasmania. Temperatures were 4.4℃ above average, partly due to the warm East Australian Current extending southwards. The heatwave began on December 3, 2015, and was ongoing as of April 17 – the longest such event recorded in Tasmania since satellite records began in 1982. It began just days after the end of the second-longest marine heatwave on record, from August 31 to November 28, 2015, although that event was less intense. Anatomy of a marine heatwave. Top left: summer sea surface temperatures relative to seasonal average. Top right: ocean temperature over time; red shaded region shows the ongoing heatwave. Bottom panels: duration (left) and intensity (right) of all recorded heatwaves; the ongoing event is shown in red. As well as months of near-constant heat stress, oyster farms along the east coast were devastated by a new disease, Pacific Oyster Mortality Syndrome, which killed 100% of juvenile oysters at some farms. The disease, which has previously affected New South Wales oyster farms, is thought to be linked to unusually warm water temperatures, although this is not yet proven. Tasmania is often seen as having a mild climate that is less vulnerable to damage from climate change. It has even been portrayed as a “climate refuge”. But if this summer was a taste of things to come, Tasmania may be less resilient than many have believed. The spring and summer weather also hit Tasmania’s hydroelectric dams, which were already run down during the short-lived carbon price as Tasmania sold clean renewable power to the mainland. Dam levels are at an all-time low and continue to fall. The situation has escalated into a looming energy crisis, because the state’s connection to the national electricity grid – the Basslink cable – has not been operational since late December. The state faces the prospect of meeting winter energy demand by running 200 leased diesel generators, at a cost of A$43 million and making major carbon emissions that can only exacerbate the climate-related problems that are already stretching the state’s emergency response capability. Is this summer’s experience a window on the future? Further study into the causes of climate events, known as “detection and attribution”, can help us untangle the human influence from natural factors. If we do see the fingerprint of human influence on this summer, Tasmania and every other state and territory should take in the view and plan accordingly. The likely concurrence of multiple events in the future – such as Tasmania’s simultaneous fires and floods at either end of the island and a heatwave offshore – demands that governments and communities devise new strategies and mobilise extra resources. This will require unprecedented coordination and cooperation between governments at all levels, and between governments, citizens, and community and business groups. Done well, the island state could show other parts of Australia how to prepare for a future with no precedent. Australia is the land of drought and flooding rains, and in a recent paper we’ve shown that’s been the case for more than 500 years. As part of our Australia and New Zealand Drought Atlas we’ve published the most detailed record of drought and wet periods (or “pluvials”) since 1500. The data reveal that despite the severity of the Millennium Drought, the five worst single years of drought happened before 1900. But 2011 was the wettest year in our 513-year record. The dominant theme of Australia’s drought history is variability. We may get one year of extremely wet conditions (for example in 2011) or we might get six years of extremely dry conditions (such as 2003-2009). North Queensland may be flooded out while Victoria suffers with drought. Or in extreme circumstances, the entire eastern half of Australia might be bone dry. Even as people change the climate by adding greenhouse gases to the atmosphere, variability will continue to play a large role in Australia’s climate. This year one of the strongest El Niños on record is kicking into high gear in the tropical Pacific, driving global temperatures higher still. To tease out these complex patterns we need to look deep into the past. The existing drought records are relatively short and geographically patchy. Measurements from weather stations rarely extend beyond the early 1900s and informal historical records from diaries and ships logs — some of which go back to the first days of European settlement in Australia — are relatively uncommon and limited to a few sites. This has limited our understanding of drought variability to what has been directly observed over the past 120 years. To extend the drought record beyond 1900, we used 177 tree ring and coral records from Australia, New Zealand, and Indonesia to reconstruct summer (spanning December to February) drought conditions in New Zealand and most of Australia. Trees and corals are sensitive to their environments. For example, trees grow less in dry years and more in wet years. We carefully examined, dated, and measured each growth ring in thousands of trees and then compared the patterns of growth to an index of drought variability, the Palmer Drought Severity Index. One of the researchers (Kathy Allen) retrieving a tree core from a king billy pine in Tasmania. This index takes into account air temperature, rainfall, and soil water-holding capacity to give an indication of the water status of the environment. However, the data only extend back to 1900. By using the statistical relationship between drought and our tree rings and coral, we can translate the growth patterns into data going back hundreds of years. What we found was a remarkably rich and complex history of wet and dry conditions, particularly across eastern Australia. A slice of coral from the Great Barrier Reef, photographed under UV light. The lines show periods when sediment from flood plumes affect coastal reefs. Over the past five centuries we found extreme droughts similar to the recent Millennium Drought, but we also discovered wet periods that lasted decades. 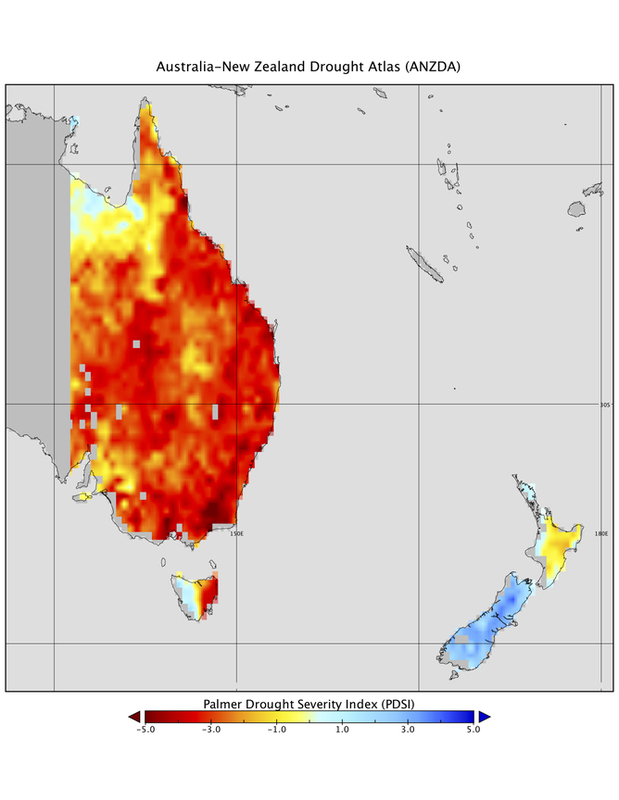 We found short droughts of brutal intensity that blanketed all of eastern Australia, while other droughts of similar intensity were confined to small pockets across the continent. The atlas also provides new geographical context for early historical droughts. For example, diaries from early settlers near Sydney documented a crippling drought in 1791-92. Our data demonstrate that this was one of the worst drought years in the past 500 years with extraordinarily dry conditions that stretched from Cape York to eastern Tasmania. The early colony was fortunate to survive. 1792 was one of the worst drought years Australia has experienced since 1500. An obvious question is how do our modern droughts and floods stack up against earlier events? Of the five most extreme single years of drought in the past 500 years (when averaged across all of eastern Australia), not one occurred after 1900. In contrast, two of the five wettest years in our data took place after 1950 (2011 was the wettest year in the 513-year record). The 1700s were particularly dry with three of the five worst drought years, but also notably had the most prolonged wet period (1730-60). In eastern Australia, wet and dry conditions cycle back and forth over several decades, driven by the oceans around us. When we compared the data to a recently developed index of changing atmospheric pressure called the Interdecadal Pacific Oscillation (IPO), we found remarkable consistency between the two. The IPO tells us when we have unexpectedly warmer or cooler sea surface temps and air pressures. The IPO also interacts with El Nino and La Nina to make them stronger or weaker. When the IPO was positive, eastern Australia experienced drought conditions for several decades; when it was negative, eastern Australia experienced pervasive wet conditions. From 1999-2012 we were in a negative phase of the IPO; now it appears we have just entered a strongly positive phase. You may have noticed that the Millennium Drought happened in a negative IPO phase. Our data show that there is a strong relationship between the phases of the IPO and drought – until around 1976. After that the relationship gets weaker. Why is a question for further research, but one possibility is human-caused climate change. This new data will help us understand what drives these swings between drought and floods, and help us predict what might happen in the future. Editor’s note: We’re publishing a series from The Story Group that shows Americans on the front lines of climate change. The videos put faces to the warnings in the latest National Climate Assessment. “This is really a call for America to find out, ‘What does climate change mean for where you live?’” says Paul Fleming, a convening lead author of the National Climate Assessment’s Water Resources chapter. Fleming talks about how climate change will challenge the reliability of water supplies in the United States in multiple ways. Alterations in precipitation patterns and reduced snowpack are some of the climate-related changes that will affect the quality and quantity of water available to Americans.